Makloc Head Office and Manufacturing plant, situation on 12 acres with a 35,000 sq foot panel plant and a 15,000 sq foot welding facility. Makloc is CAN / CSA A660 Certified, CWB CSA W47.1 Certified, holders of COR certificate and are members of ISNetworld, PICS, CanQual and Comply Works. 3 acre main yard with a 14,000 sq foot Sales Office and Warehouse. Another 4 acres dedicated as a construction yard for modular building erection, securely fenced and powered. A 12,000 sq foot Office and Warehouse with a 17,000 sq foot welding facility situated on 7 acres with an additional 3 acre construction yard. A large 6,000 sq foot modern paint facility with capacity for 24’ wide x 85’ long skid units. 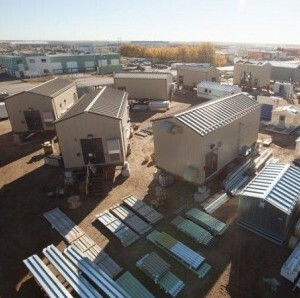 With offices and manufacturing facilities in Edmonton, Morinville and Calgary supported by a team of over 200 employees, Makloc Buildings Inc. has the expertise and infrastructure to design any facility to meet your project specifications.